Does anyone really use these any longer for CDs? Digital content has made the CD player an almost useless device in most cars. It’s so much easier to load your content to your smartphone and then stream the audio to your car speakers. Most vehicles manufactured over the past several years have a USB port and an interface for streaming your music. Some permit use of Bluetooth. Others may use an FM transmitter connected to your device. You can read about FM transmitters here. So what you do with the CD Player? Use it as a place to mount your phone! CD player cell phone car mounts were introduced several years ago. Manufacturers realized that the CD players aren’t used very much and the location of most players are at a perfect place to be able to see your phone without taking your eyes too far off the road. There are a few things to check before buying a CD player car mount. Most CD players are located just above or below your radio or in some case, your console display area. The placement of a CD player car mount might block access to the radio or your console display area. Some may find this bothersome and a different mount might be best if that’s the case. A second consideration is the proximity of the CD player to your vehicle’s stick shift. When the car is in park, ensure there is adequate clearance between what will be the end of the CD player mount and the stick shift. If the mount will extend too far, you might interfere with the stick shift when it is in the park position. Thirdly, be sure to measure the width of your smartphone. Most CD player car mounts come equipped with a universal cradle which you will want to ensure will fit your device. Although most of these mounts are sold with smartphones in mind, they can also be used for a GPS. There are also mounts that use magnetic attachments if you don’t mind attaching a small metal chip to the back of your device. I would not go heavier than a GPS or smartphone when using a CD player mount. There are a few different types of CD player car mounts. 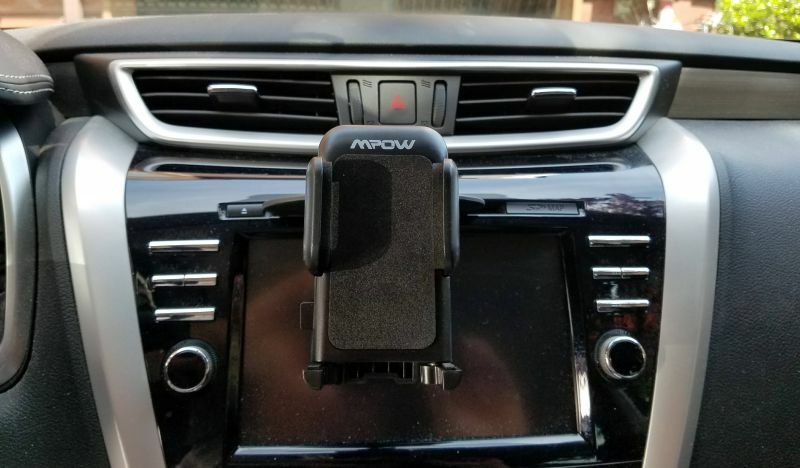 The Mpow CD Slot Mount for SmartPhones uses a knob on the bottom to secure the mount within the CD player. That’s the one in the photo that accompanies this article. I prefer this mount to others in this category as it will permit a more custom and secure fitting. You don’t want the mount to rattle around inside the player. The Mount Easy CD Slot Car Mount Holder for Cell Phones uses a spring-loaded attachment that inserts into a CD player and locks itself in. A little different of a concept and might be worth trying if the Mpow model doesn’t fit well. Both are easy to attach and remove but be sure not to tighten too much or force it in. If it doesn’t fit well, don’t use it. Your CD player should be unaffected by the installation of a mount. It will not think there is a CD mounted, at least not in my experience. I have a feeling that in a few years, vehicle manufacturers are likely to completely eliminate CD players from cars, or perhaps make it an option that you will pay for. Given the fact that more and more people have smartphones with digital content, the usefulness of a CD player beyond what might be a good mounting point will be somewhat limited.